The region has two distinct seasons: the dry, and the wet. In the dry season, the land will not see any rain for several months, and many of the ponds and small lakes will dry out completely. The vegetation will lose it’s colors, and many of the trees will drop their leaves in a strategy to pass the harsh times. Animals will struggle to survive and often congregate along rivers and the few water ponds that still remain in the plains. But, when the rains start in November, the landscape changes completely. The soil quickly gets saturated, and the rivers bring even more water from the upland areas, and up to 80% of the entire region will be under water. It is so much water that the first Spanish explorers that got to the region named it the Sea of Xarayés, after an indigenous nation that lived in the southern part of the plains. By March several species of fish, snail and crab will be occupying the same fields where, months earlier, Greater Rheas would hunt for insects in the dusty grasslands. The slightly higher forest packs become islands where many species of animals will look for refuge, such as Coatis, Armadillos, Crab-eating Foxes and even Jaguars! Thousands of water birds will congregate, taking advantage of the abundance of food to nourish their young. It is the most beautiful season in the Pantanal, when the vast fields will either be covered with tiny water flowers or reflecting the blue sky above, an experience like no other. 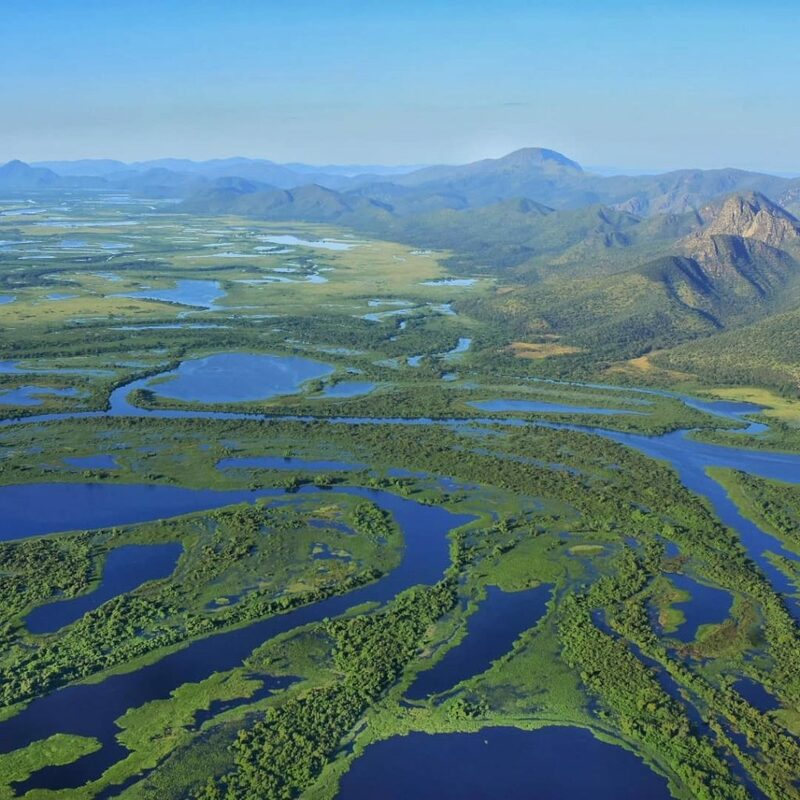 Although most visitors come to the Pantanal in the dry season, the beauty of the rainy season is just one of the reasons to visit the plains when the waters are high. Although driving may be difficult (but fun) at some of the roads, the Transpantaneira road remains passable through most of the year, granting access to most of the lodges in the region. With the higher water levels, boats can go even further on the smaller rivers, and sometimes even over the plains. And, we are able to explore on horseback and canoes where we would otherwise walk or drive in our safari vehicles, providing a different experience that offers an even deeper connection with nature and the environment. For the birdwatchers, a good reason to come at the wet season is the Zigzag Heron: this rare and elusive species becomes a lot easier to find when the water level is high. On top of that, all the special birds of the Pantanal are resident to the plains and can be found any time of the year. By the end of April the waters start to recede, and ponds and lakes start to take form again, trapping the fish that have already reproduced in the vast water body. By July most of the land will be dry again, and the great cycle of the waters will be complete. If you are curious to learn more about the Pantanal or other areas of Brazil, please send an email to info[email protected]!